We are proud of our Auggie TRIO/SSS participants and their achievements. Scroll down and click the links below, or visit our Monthly Student Spotlight or Testimonials sections to read more about our students who are working hard and have overcome many obstacles to achieve their academic and personal goals. Lorreal was selected to be a Traveler’s EDGE Scholar and is featured in a short video about her Traveler’s EDGE experience. Dustina Granlund ’14, was also a Traveler’s EDGE scholar. Kassie was a featured educator for Education Post, a a nonprofit, nonpartisan communications organization dedicated to building support for student-focused improvements in public education from preschool to high school graduation. Mary was the May 2013 Commencement speaker. Mary is quoted here and there are pictures of her and the graduating class. Heidi was recently featured in an alumni spotlight for the University of Minnesota’s College of Pharmacy. Tenzin was chosen to assist His Holiness the 14th Dalai Lama during the Dalai Lama’s 2014 visit to the Twin Cities for the Nobel Peace Prize Forum and the Tibetan New Year celebration. Stories about Tenzin’s involvement were featured in the St. Paul Pioneer Press and on local CBS affiliate WCCO. Kuoth was selected for a role in the Warner Bros. feature film “The Good Lie,” about “The Lost Boys” of Sudan. The movie stars Academy Award Winner, Reese Witherspoon (2006 Best Actress in a Lead Role for “Walk the Line”). Kuoth has been featured in several articles in the St. Paul Pioneer Press (May 19, 2013 and October 2, 2014). 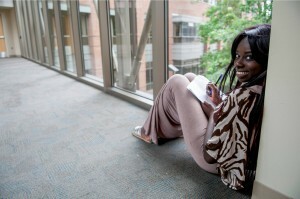 Kuoth was also interviewed for the Augsburg University Student Newspaper, The ECHO.